How To Be an "Ice Blocker"
Measure the amount of space in your freezer. You may need to remove your ice maker tray and shift the food around to maximize the available space. Find a box to use as a mold. I lucked out and found a box that was 4" x 17" x 17" (it was a box for an LCD monitor)... it was the perfect size for the freezer. If your box is too large, you can cut it in half, slide the two halves together (pushing one half into the other half) and the tape the two pieces back together. Keep in mind that water is heavy. Don't try to make a sled that will be too heavy to pick up! Line the box with a trash bag. Place the trash bag inside the box (you may need to cut the bag so that it opens up and can fully cover the inside of the box). Tape the bag to the outside of the box so that when it is filled, the water will not touch the cardboard. Fill the mold with water. Being careful to support the bottom of your mold, fill it with cold water. 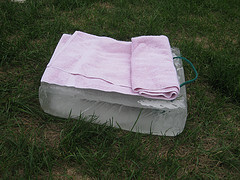 About 3" or 4" of water is all you'll need for a nice, thick block of ice. Freeze the water. Place your mold in the freezer. It will be heavy so you may need some assistance getting it into the freezer without the water spilling. Add a handle. Take 18" of rope and place each end in the water towards the front of the mold. Get at least 4" of rope under the water so that it will be secured once the water freezes. Cool Tip: Bring an extra rope to the "slopes". You can feed it through the handle to make pulling the ice block uphill a breeze! Let the water freeze. Depending on your freezer, this could take up to 48 hours to freeze all of the way through. Be sure to turn the temperature controls to their coldest setting. Once you have your ice block created, grab a towel to put between you and the ice, review the steering and safety tips, go find a hill and try it out! You'll want to find one with a nice, smooth terrain that will have plenty of room at the bottom to coast to a stop. Even relatively small bumps in the soil can cause your ice block to stop... causing you to fly off!